It’s another hot one. A cold one from one of our outstanding local breweries would be just the ticket to cool off and get your chill on. Here are some recommendations from Raleigh, N.C., area brewers, which include not just their own summer seasonals, but also their favorites from other local operations here in one of America’s best beer towns. Dave Rogers at Big Boss Brewing Company reminds us that their dry-hopped Centaur (pictured up top), available on tap and in the Big Boss variety 12 pack in local stores, is a traditional farmhouse Saison. Slightly fruity and balanced with pungent American Mosaic hops, this is the quintessential summer seasonal at 6% ABV. 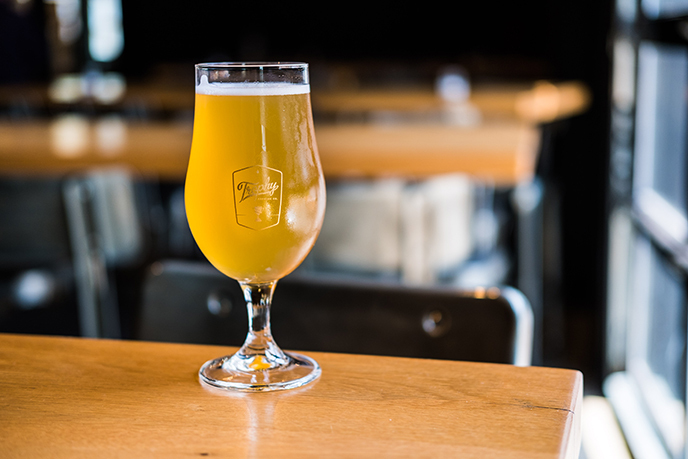 Rogers also singled out Starduster, a light, 4.5% ABV European-style pale ale single hopped with Green Bullet, a hop typically used in IPAs, available on select local taps. 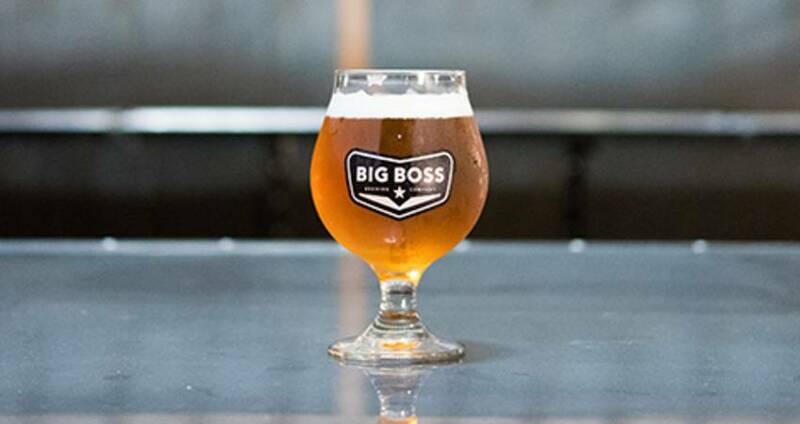 Meanwhile, at the Big Boss brewhouse, a lime cucumber version of their popular witbier Blanco Diablo (4.5% ABV) and a strawberry mint version of the new Sunday Punch American Sour (4.5% ABV) are currently on draft. Looking at other Raleigh breweries, Rogers recommends Trophy Brewing Company’s Motueka D.A.V.E. (Drink All Varieties Experiment), a 5.5% ABV pale ale made with Motueka hops from New Zealand, part of Trophy’s single hop series. At Trophy, brewmaster Les Stewart goes to bat for Darryl (pictured below), a 5.3% ABV strawberry spring ale–part of their Farmer’s Market Series–brewed with 300 pounds of N.C. strawberries. Next up in this series: Peach Farmhouse Saison. Stewart also recommends BreakAway, the classic 6.5% ABV Belgian-style Saison from Crank Arm Brewing, balancing notes of fruit and spice with medium-range hop bitterness. Ted Gross, the marketing manager at Lynnwood Brewing Concern, says their 5% ABV raspberry American wheat beer, Back That Razz Up, available in bottle shops and on tap locally, is not to be missed. In turn, Gross sings the praises of Raleigh Brewing Company’s Dear Ol’ Dixie, a sessionable 5.6% ABV Extra Pale Ale offering savory fruit and the hop-forward flavor of an IPA with less bitterness. Over at Raleigh Brewing, head brewer Alex Smith is sweet on First Squeeze, their 6% ABV American wheat beer brewed with blood orange, delivering a clean, crisp and citrusy taste with “creamsicle” richness derived from wheat malt. Smith gives a shout-out to Bond Brothers Beer Company in Cary and their kettle sour series, Sorcery (4.5% ABV). The next two releases, available at the Bond Brothers taproom and select area bars, will feature elderflower, coriander, and grapefruit peel, followed by a version with cranberry and blueberry, each producing a crisp, tart drinking experience perfect for warm weather days. Finally, sales executive and jack-of-all-trades Michelle Baker at Aviator Brewing Company says Mad Beach Wheat, a 4.8% ABV American wheat beer spiced with orange peel, is their top seller during the summer months. Grab a pint on tap at their brewery, Smokehouse or Tap House (can also be found at bottle shops). Baker also gives an enthusiastic thumbs up to Bombshell Beer Company and its Strawberries & Cream Summer Ale. Smooth and silky at 5% ABV, Strawberries & Cream is available on tap as well as in select bottle shops. Here’s to staying tastefully refreshed.